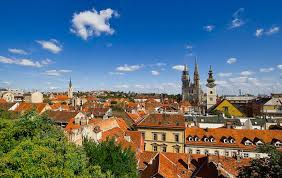 I mean people don’t usually choose to visit Zagreb when deciding on what European city/country to visit but luckily for me, Nat and her husband decided to spend some of their vacation at the beautiful Croatian seaside so Zagreb found itself on their itinerary as well. I got to meet with Natalie, twice, first when she arrived and then again when she was leaving which was great, as the first time I got to know her and answer her questions about Croatia and the second time around, I got to hear of what it was like for them spending a vacation here. Those of you who met Natalie probably already know what a lovely, beautiful person she is. We certainly didn’t lack subjects when we met and I was so very happy that when we visited Top perfumery, our host Borut provided us with some yet unreleased perfumes to smell (he is just a great perfumista himself with a large knowledge of perfumes). So that’s a place you need to visit once in Zagreb. I was very happy to learn on our second meeting that I installed a bit of a curiosity in Nat and her husband when it came to Croatian drinks and I also realized that in their commitment to try them all (or as many as possible), they landed upon one of my favourites called Pelinkovac (meaning done from the plant mugworth/wormwood – I needed a dictionary for that one). I know you all know what an incredibly lovely experience it is meeting perfumistas in real life but I still need to say it. It was great fun meeting Natalie and I certainly hope we get to see each other again. But you know, I cannot but help thinking that recently that trend has been on the rise so I have feeling we all might be meeting each other more and more often in the future. Sounds like you had a blast together, great! I’m leaving on my vacation on Saturday, can’t wait! Natalie is all what you said 🙂 I’m glad that you’ve got to meet and I hope one day to meet with you (and several more of my favorite bloggers in Europe and at home). Croatia is a nice, small country to visit. I’m glad you got to meet Natalie and that she enjoyed her stay in your country. My girlfriend and her family are moving to Zagreb. Actually her husband is already there and working. I’m not surprised that you’re re-reading Harry Potter. I’ve lost count of how many times I’ve re-read that series of books. I find it interesting hearing about people moving to Croatia (because many Croatians would rather move out considering the state of our economy). I’m meeting Natalie in about hour here in London! Can’t wait. I think you’re right about the trend for meet-ups. We have lots of real life connections now too which is great. Are we going to hear about your meeting? I’ve not written it up but you’ve probably seen by now Natalie has done a lovely post on her recent meet-ups, including ours. She is an absolute sweetheart, as you know. Ines, you are one of the top ‘perfumista meeters’ if I may coin a phrase, whether abroad – Paris, Vienna, soon to be Rome – or in your home town. I do hope I get to meet you some day. Another work trip to Croatia – coming a bit closer to you next time – seems a distant prospect, but you never know. Undina really should draw us a diagram of all the fumeheads who have met – it is getting increasingly criss-crossed, the world over! A work trip to Croatia sounds just the thing! 🙂 I do hope it comes true. I couldn’t agree more about Undina’s diagram – that would be fun to have a look at. Meeting Natalie would be a treat – oh, you lucky girls (Ines, Tara and Vanessa)! Ines, that drink you mentioned made with mugwort sounds like something out of Harry Potter. 🙂 Although when you use the term wormwood, I’m thinking this drink might resemble absinthe, maybe? Having never tried absinthe, I couldn’t say whether it resembles it but it’s brown in colour. I love the Patronus allusion. Meeting frag heads is exactly that kind of happy memory creator. I don’t know anyone here who does it. Whoa, wait? I didn’t respond! Not sure how that happened. Thanks for everything – it was so nice to be able to ask you questions when something about Croatia perplexed me, and we enjoyed your lovely home country to the nth degree. EVERYONE SHOULD GO TO CROATIA. IMMEDIATELY. I love answering questions about Croatia (if I can), it means people are interested in learning more about it.